Mrs ___________Your Name Here_________, Can we do a treasure Island Game Today? 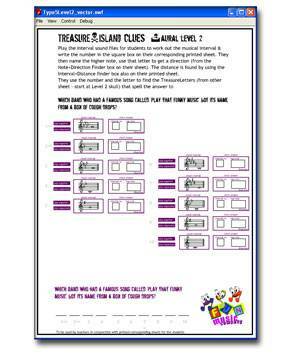 This is what you are likely to hear from your music class once you´ve introduced them to “Instant Print Music Sheets” first module “treasure island games”. The trivia questions are all interesting tid-bits of information which are related to music, but that the students are unlikely to know straight away. If they do there is no problem – they will still need to complete the exercise to confirm that they are right! The clever part is that each set is different and requires different theoretical knowledge. There are five different “sets”, and each set has four “levels” with different concepts covered. Set One covers basic information that most junior high music programs require. Being able to identify Key signatures is an important concept, as is knowing the correct number of bars in a phrase. Even the most inexperienced students should be able to do Set 1, Level 1 after only a few lessons. Level 3 and 4 is more suited to slightly more experienced students, who know about Key signatures and scales. In All the sets in Treasure Island Games the same “map” is used for each of the four levels. It doesn’t matter if your class does one sheet from the set, or all four! Many students struggle being able to know the interval between two notes, and this is an essential skill before attempting intervals as an aural activity. The only thing that is going to help them is practice, practice, practice, and that is what Set 2 of this module achieves. If your students complete all four levels of this set then you can be confident of their knowledge of intervals. They don´t need to aurally identify them – that comes later! In each set the four levels range from easy to moderately advanced, so there is a worksheet suitable for most classes at a Junior High School level. TIES and SLURS! How many students get confused between them! How silly to have a musical notation system that has the same symbol ( a curved line) for two different functions! We can´t change the musical system that has been used for hundreds of years, but we can find a new way of helping children to understand the difference, and that is what level 1 and 2 of this series will do. Level 3 and 4 are far more advanced – in these activities students identify the tones and semitones within a melody, taking note of the key signature. These are probably the most advanced of any within this module. 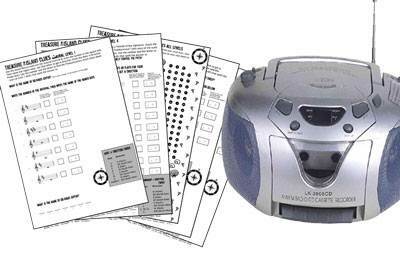 I even got some of these wrong during our testing procedures! If your students are getting over-confident these ones will test them out! 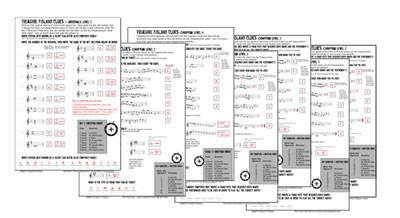 This module of theory sheets is also ideal to give to individual theory students to support their work in Intervals, Scales and Melody. It will break up the monotony of the theory book, and give the theory student something exciting to look forward to! Scales and technical names – How BORING! Not with this set of Handouts! Whether you like it or not – its still important for students to KNOW the scale technical names (like dominant, subdominant etc) How else as musicians are they going to know what to play when another musician tells them to play a Dominant 7th chord? They might be outdated terms, but in the opinion of the majority of music teachers I´ve talked to they are still important. 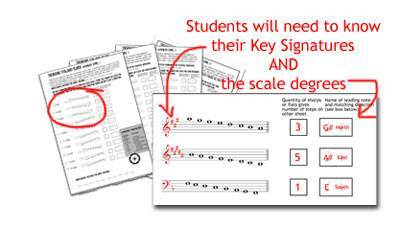 This set also addresses a major issue with theory examinations – writing scales with accidentals OR key signatures. When sitting exams countless students have been tricked and got wrong answers because they didn´t read the question correctly! These worksheets cleverly address this! Level 1 – Adding a Clef and Key signature to a given scale, then naming the scales leading note. Level 2 – Adding a Clef and Accidental to a given scale, then naming the scales dominant note. Level 3 – Writing a two octave scale with accidentals (major and harmonic minor only), and then naming the mediant. Level 4 – Writing a one octave scale (major and natural minor), and then naming the subdominant note. 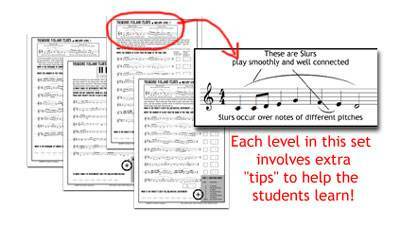 This last set of worksheets in “Music Theory Fun Sheets” involves an activity where the class must listen to aural examples. As the teacher YOU are in control of how you present it to the class…. read on! Q. How much practice does your music class need with recognizing intervals aurally? A. As much as they can get! This set requires your students to use their EARS as well as their brains! 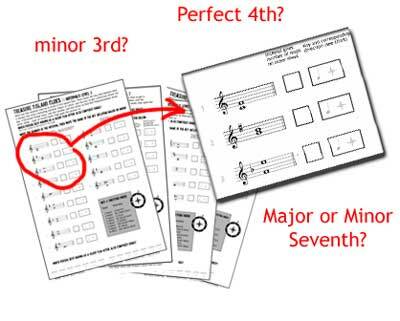 There is a teacher resource included that allows you to play a CD to the class and they will have to identify the interval played, and if they get it right then they´ll be able to find the awnser to the trivia question – just like all the others! Level 4 – All of the above, plus the tritone. Along with the purchase of Module 1 “Treasure Island Games” you get a set of MP3 files which match these four levels exactly. This way you can simply burn the files to CD, and you can give the CD to your relief teacher. You don´t even need to be there!!! How do you play the Aural examples? 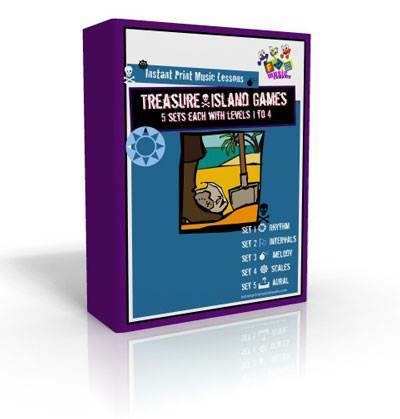 Supplied with Treasure Island Games are the mp3 files which you can burn to CD for use in your classes. However we throught there HAD to be a better way than the old way where the aural example is played a fixed number of times. That is an OK way of doing it, but as the teacher it doesn’t give you much control. So we came up with…..
to play the aural examples! What if you want to challenge your class a bit more by having them played only ONCE? What if you need them played more times than it is played on the CD? Wouldn’t it be GREAT if you could simply have a little button that would play the example as many times as you need for your students? Along with the purchase of Module One you get a self contained computer program that you can run on your own computer in the classroom, and play the intervals in your own time. This little program is supplied in both Windows and Mac Versions, and it is super easy to use! Test it out right now! You can also use it to help teach the intervals and have additional practice, prior to doing the actual worksheet activity if you wish. Therefore it is your choice…. We know that YOU wouldnt have to think too hard to find the answers to these questions…. but what if you wanted to leave one of these activities with a fill-in or relief teacher? Unless the teacher knows about music, any worksheet that you give the class is going to present a few issues.. 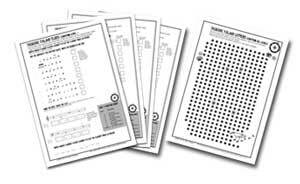 BUT we’ve made this as painless as possible by providing a fully completed version of every single worksheet, so that if you have a fill-in or relief teacher you simply print one copy of that along with the class set. How do I download them and get started? Don’t worry if you aren’t very computer literate: We’ve made it as easy as possible to download and use these materials. You can access the system from school, or from home – whichever you prefer. It’ll be your instant lesson plan solution! If you order now through our secure ordering system you’ll have instant access to the materials, and you can print them out to use in your lessons tomorrow! This is the way this works – You can purchase module one today for just $29.95 (USD). Alternatively The Whole Module (including the bonuses) is available in the Music Theory Fun Sheets Package deal for a limited time for just $69.95. Full Set of completely answered versions with teaching hints for non-music teachers Priceless! Incredible Value for Music Teachers…. So, for around the cost of one CD you’ll have access to twenty different activity worksheets, that you’ll use time and time again. If you value your time like I do, then take action today and save yourself some time!